The San Diego County Democratic Party isn’t just hoping to win a lot of seats in the upcoming election — it’s spending a lot of money to make that happen. So far, the local Democratic Party has spent more than five times what the San Diego County Republican Party has since the June primary, according to an inewsource analysis of campaign finance reports. The local Republican Party has spent about $107,000 on six candidates running for city, county and state offices since the primary. During that time, the Democratic Party has spent more than $557,000 on 21 candidates. The spending reflects an important year for the Democratic Party, which is hoping to flip key seats on the all-Republican county Board of Supervisors and on the San Diego City Council. 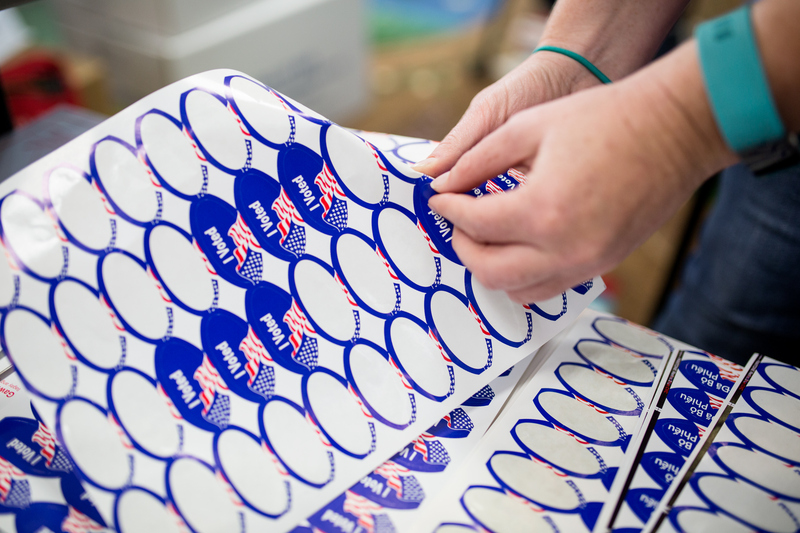 In the past 10 years, Republican voter registration in the county has fallen from a three-point lead over Democrats to a seven-point deficit, but Republicans still hold more than half of the elected offices in the county. About one-third of the Democratic Party’s spending since the primary has supported county supervisor candidate Nathan Fletcher, a former state assemblyman facing former District Attorney Bonnie Dumanis, a Republican. The winner of the central San Diego seat will replace termed-out Republican Ron Roberts, who has held the seat for 24 years. “We are desperate to get a seat to really make change at this level, on issues like homelessness and housing,” said Jessica Hayes, chair of the local Democratic Party. When you combine spending in the primary and general elections, the party has spent $1.1 million supporting Fletcher — a Republican turned independent turned Democrat. That’s more money than either party has spent on any other candidate this decade, a July inewsource analysis found. The Republican Party has spent a total of about $196,000 on Dumanis. San Diego County limits donations to supervisor candidates to $25,950, but state law allows political parties to spend unlimited amounts of money communicating with members of their party about who to vote for. The local Democratic Party has spent about $7.22 per registered Democrat in the 4th Supervisorial District to support Fletcher, using a combination of targeted fliers, online ads and phone banks to communicate with Democrats. The local Republican Party has spent $2.82 per registered Republican in the district to support Dumanis. 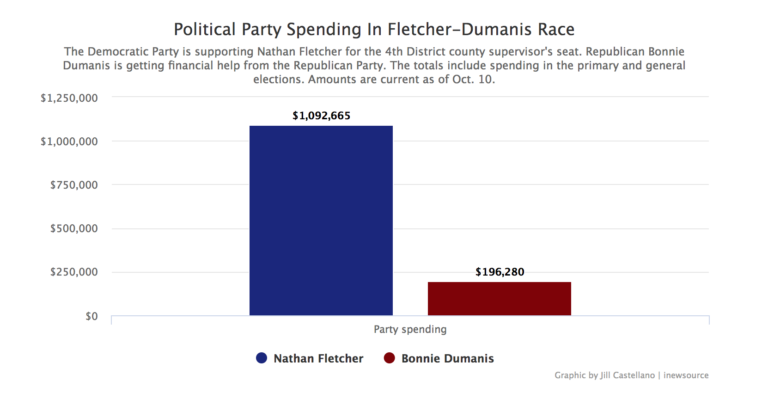 Dumanis and Fletcher are also getting financial help from political action committees, which can spend unlimited cash to support candidates if they don’t coordinate with the candidates’ campaigns. The competitive primary race resulted in unprecedented levels of outside spending for a county supervisor seat. As the only Republican in the race, Dumanis is getting financial support from the San Diego Regional Chamber of Commerce and Lincoln Club. A new PAC, Women in Leadership Supporting Bonnie Dumanis for Supervisor 2018, was formed on Oct. 5. The only donor is the chamber of commerce, which has given $150,000. A PAC called San Diego Strong in Support of Nathan Fletcher for Supervisor 2018 has spent $377,000 on Fletcher. Its biggest donors are unions, including the United Domestic Workers of America Action Fund and the Service Employees International Union local chapter. SEIU is the largest union for county workers. In the other county supervisor race this year, the Republican Party has outspent the Democratic Party for the North County District 5 seat. The Republican Party has spent more than $31,000 supporting San Marcos Mayor Jim Desmond, who is vying to replace termed-out Republican Supervisor Bill Horn. He has held the seat for 24 years. But all that spending was for the June primary. The Democratic Party has spent about $10,000 on Democratic candidate Michelle Gomez. When you count up the local party spending for the primary and general elections, the Democrats are investing a lot more on their candidates than the Republicans are. The Democratic Party has spent more than $1.7 million compared to about $565,000 for the Republican Party. And since Labor Day, when election spending typically ramps up, the Republican Party has only put money into two races: about $38,000 for Dumanis and about $39,000 for San Diego City Councilwoman Lorie Zapf. Zapf, a Republican, is running in District 2 against Democrat Jen Campbell in a coastal district that includes Point Loma, Mission Beach, Ocean Beach and Bay Park. If Campbell wins, the Democrats would likely have a 6-3 majority on the City Council, giving them the votes to override Republican Mayor Kevin Faulconer’s vetoes. The county Democratic Party has spent almost $96,000 supporting Campbell since Sept. 1, more than double what the Republican Party has spent in the race. But Krvaric said he thinks money isn’t the big driving factor that will get voters to the polls this November — national politics will. “The more these people are climbing on the walls of the Supreme Court building or tweeting about impeaching (Supreme Court) Justice (Brett) Kavanaugh or impeaching the president, that turns off the average voter sitting in Clairemont right now just figuring out who does he want to have in charge of our government locally, state or federally,” Krvaric said. The impact of Kavanaugh’s controversial confirmation to the Supreme Court on voters is unclear. Some polls indicate it has energized Republican voters, while others show backlash to the confirmation has given Democrats an advantage. “While women may not have had a voice with this particular justice on the Supreme Court, we have our voice at the polls, and at the polls we will find justice,” Hayes said. The Democratic Party also has started investing in candidates in other areas of the county. It has spent about $6,000 on Chula Vista Mayor Mary Casillas Salas’ re-election, plus about $2,000 each on Chula Vista City Council candidate Mark Bartlett and National City council candidates Jose Rodriguez and Mona Alvarado-Rios. The Republican Party has not spent any money in Chula Vista and National City races since the primary. The impact of the political party spending won’t be known until the votes are tallied on Nov. 6. Party spending doesn’t guarantee a candidate will win, but Dominguez says it gives candidates a better chance.